The concert venues available in Warsaw are clearly too small to accommodate this obviously growing audience demand. I cannot help reflecting once again on the desperate need for a world standard modern concert hall with modern facilities in Warsaw. The country is littered with fabulously expensive, under-utilised football stadiums and no political will to build a venue worthy of the remarkable artists and audiences who now struggle to perform at and attend musical events in Warsaw. I am not against sport and play myself (cricket mainly) but the financial priorities concerning musical culture in Poland are woefully inadequate by world standards. The whole situation regarding proper concert-going is a scandal and considering the awesome pre-war international reputation of the country in pianists, orchestras and conductors, the politicians of today should be ashamed of themselves and hang their heads. The emerging moneyed middle-class and more importantly their children in Poland have inadequate cultural education and exposure to the prestige and personal growth implicit in high-quality musical culture and knowledge. Sport dominates their childish and as yet unformed horizons. Of course a great deal is being done in musical education but a vital issue has not been addressed or ignorantly ignored and that is the provision of modern concert halls. For musical life, for example, is certainly much the same in its essentials as it was before Liszt. It has a different colour, partly different forms, an above all new names. But the essence, the routine, the fashion, the ignorance and pettiness, the envy and intrigue, the success of the incompetent and mediocre, the failure of the truly important, the money-making of the adaptable and the poverty of the independent-willed - that has all stayed the same as it was before.....Musical life has its great ones on whom to model itself , and it honours them - but from a distance! The first item on their programme was completely unfamiliar to me and a delight from beginning to end - the Symphony in G minor A42/I:27 by Antonio Rosetti (1759-1792). No, he was not Italian - his name was 'Italianised' perhaps to secure more interest in his music considering the passion for Italian composers of the day. He was born Franz Anton Roesler in Northern Bohemia and was a contemporary of Haydn and Mozart. Such charming and gracious music. He is perhaps best known for his horn concertos which may have inspired Mozart's own. Concerto Koln were their usual magnificent selves playing on period instruments under the baton of Howard Shelley - what a superb ensemble they are! Howard Shelley had already recorded the final two exceptionally charming and tasteful works on the programme Franciszek Lessel's (1780-1838) Piano Concerto in C major, Op. 14 and Ignacy Feliks Dobrzynski's (1807-1867) Piano Concerto in A flat major, Op.2. The recording he made with Sinfonia Varsovia for the Chopin Institute is marvellous and should be in every collection of those Chopinists interested in putting the composer in a proper cultural context - which you all should be! He did not live in or emerge fully formed from an historical vacuum. 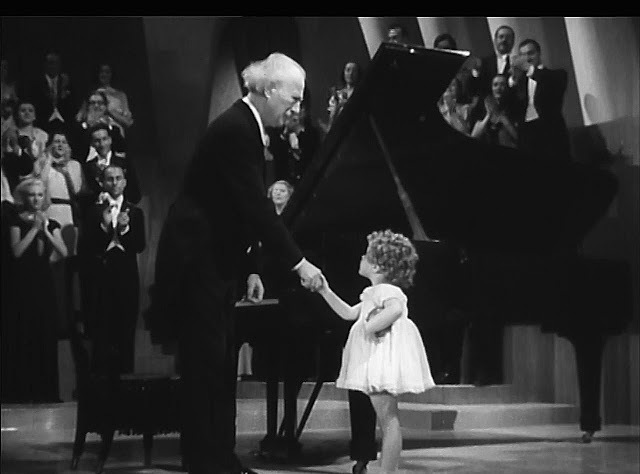 Dobrzynski was an child prodigy and a pupil of Jozef Elsner who was also Chopin's teacher. He wrote in his final report on Dobrzynski that he possessed ' uncommon abilities'. There seems to be some musical cross-fertilisation between these two young tyros, at least in concertos for the piano. His symphonic music deserves your attention. Both were influenced by the piano concertos of Hummel, especially Chopin in his utilisation of the styl brillant. Lessel graduated as an architect in Vienna (!) but was intensely musical and subsequently became the second of Haydn's Polish students. The performance of Shelley conducting Concerto Koln from the Chopin Institute Erard instrument was most elegant and refined. He has made the difficult temporary transition from modern Steinway to historic Erard very skillfully with a fine ear for nuance and controlling his dynamic - never breaking through the tone ceiling of the earlier instrument (like too many virtuosos) and making it truly 'sing' with lovely tone. A superb performance indeed. 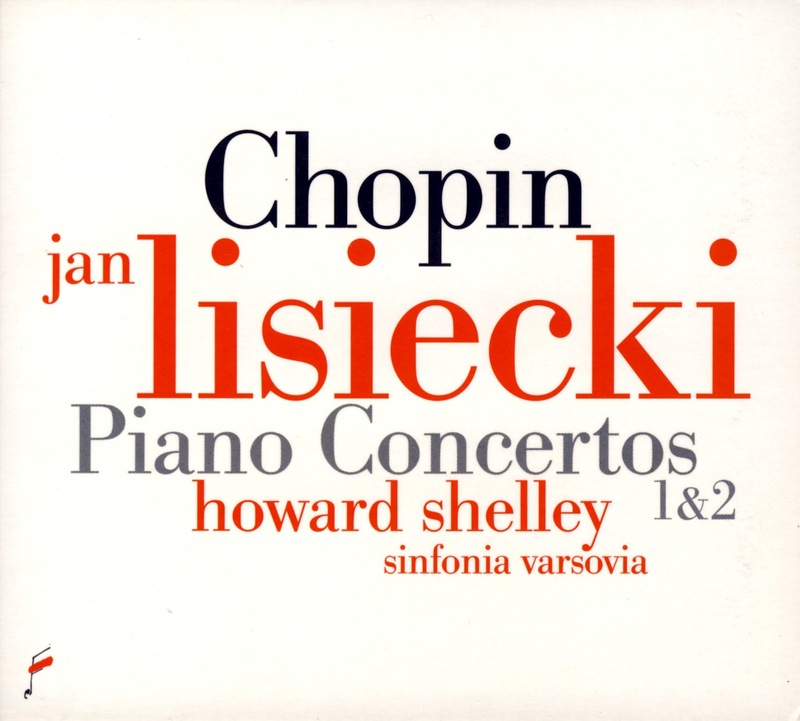 You really ought to buy the recording of these two concertos with Shelley on a modern Steinway and the great Sinfonia Varsovia from the Chopin Institute shop. I play this CD quite often and it never fails to lift my spirits. This concert was dedicated to the memory of Bohdan Pociej (1933-2011), Polish author, musicologist, writer on music, music critic and populariser of music. 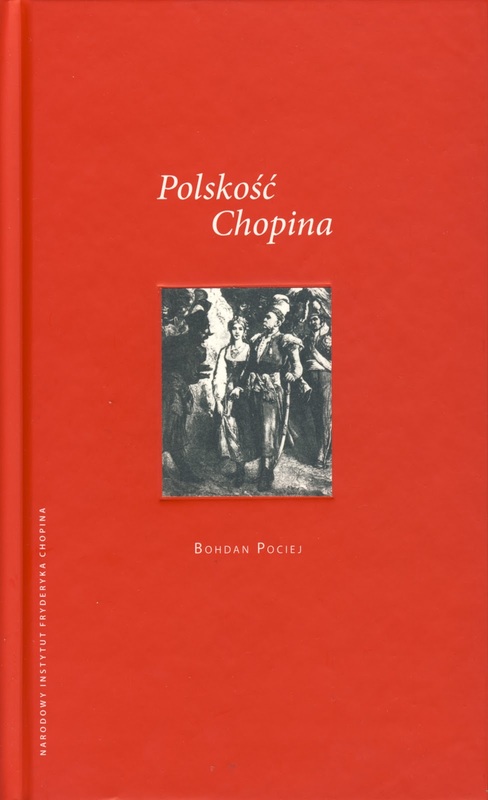 The concert also launched the posthumous publication of his book The Polishness of Chopin and was in the presence of his graceful widow. The audience were each given complimentary copies of the book. The concert began with an informed eulogy for Bogdan Pociej conveniently and very well translated into English (Duszniki Zdroj Festival take note). 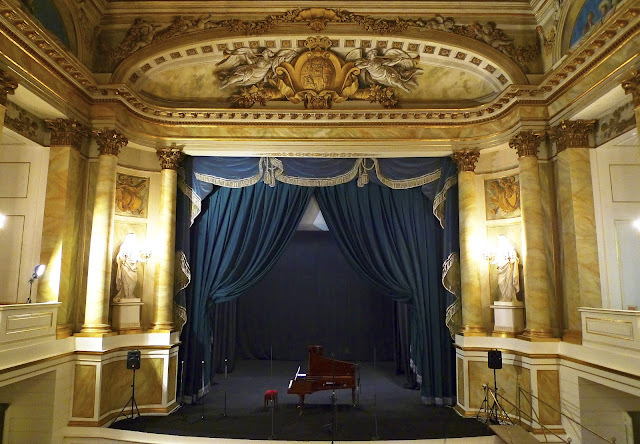 Miraculously this 18th century Court Theatre in Warsaw, the sole surviving one of its kind in Europe, escaped the sytematic destruction of the city by the Nazis. The seating is of refined simplicity and the decoration is superb with a magnificent ceiling painted by Jan Bogumil Plersch representing Apollo driving a quadriga surrounded by Geniuses. 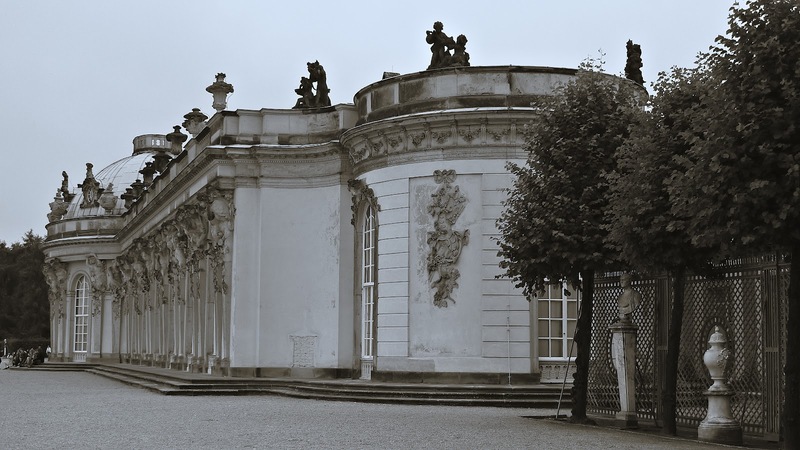 It is a perfect example of the unique Stanislawian aesthetic in art and architecture evolved by that extraordinarily artistically gifted but somewhat unpopular King of Poland, Stanislaw Augustus Poniatowski. 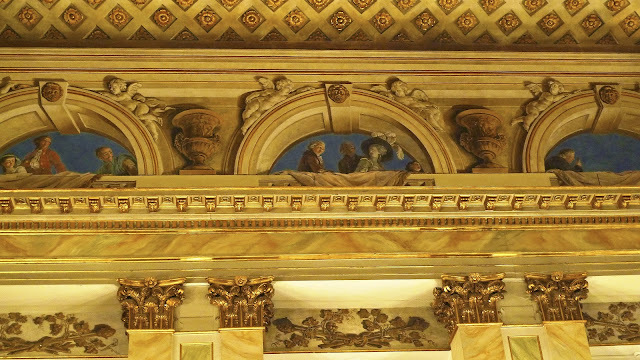 Four medallions in each corner represent the world's greatest dramatists - Sophocles, Moliere, Racine and Shakespeare. Last year at the concert here I forgot my camera but this year, armed with my trusty Leica, I can present you with some pictures of the interior of this truly wonderful theatre. Please excuse the lack of Polish and Czech diacriticals but Blogger, being an American invention, remains imperiously English. The concert began with a truly obscure group of songs entitled in a manner reminiscent of a Jorge Luis Borges short story - Ancient Songs from the Kralove Dvur Manuscript, Op. 82. The composer of this work, Vaclav Jan Krtitel Tomasek, was an eminent Czech composer at the turn of the nineteenth century - a pianist and teacher prominent in the musical life of that most musical of cities, Prague. The story behind the songs is sufficiently labyrinthine to recall a plot by the great Argentinian writer. In 1823 the Czech poet Vaclav Hanka composed six songs to texts he had discovered - allegedly a 'royal court manuscript' - which was supposedly a collection of thirteenth-century patriotic Czech poetry. Although the manuscript turned out to be a hoax perpetrated by Hanka and one Josef Linda, it became a source for many Czech composers during the period of national revival. Even Anton Dvorak would compose songs set to the same poems. I found the settings pleasant charming and lyrical works that transported one back, particularly in these surroundings, to a gentler age of Nature, sensibility and heartfelt emotion. Blazikova's voice suited these undemanding pieces and Switalwa was the perfect understated accompanist on the Pleyel - the dynamics of voice and instrument beautifully balanced. Hana Blazikova and Wojciech Switala on the stage of the Old Orangery Theatre, Lazienki Park, Warsaw, Poland. At the conclusion of this song group Switala played the Chopin Nocturne in E major, op. 62. No.2. Switala is one of my favourite Polish Chopinists and this was a fine performance on the Pleyel with a great deal of nuanced rubato and subtle inflections of mood. He may even have been a little nervous as I have rarely seen him play from the music. Again, quite a magical moment in this setting. The Nocturne was a fine introduction to the group of Chopin Songs Op. 74. I have often wondered what prompted Chopin to set the rather undistinguished rustic poetry of Stefan Witwicki to such beautiful melodies and what it might tell us about his sensibility and taste - but then he was in the bloom of youth. This passionate lover of the operas of Bellini hardly cared for these particular children yet they are moving in a youthfully ardent way. Zyczenie (A Maiden's Wish) was popular in his day and remains so in ours. Smutna rzeka (Troubled Waters) is a dark and tragic song. Certainly the Mickiewicz and marginally the Zaleski poems offer much finer fare. Of course Chopin sang so gloriously in his absolute piano music, perhaps mere words seemed too concrete for comfort and his musical imagination. This refined account of the Chopin songs was concluded by two Nocturnes Op. 48, No. 1 in C minor and No. 2 in F minor superbly performed by Switala. 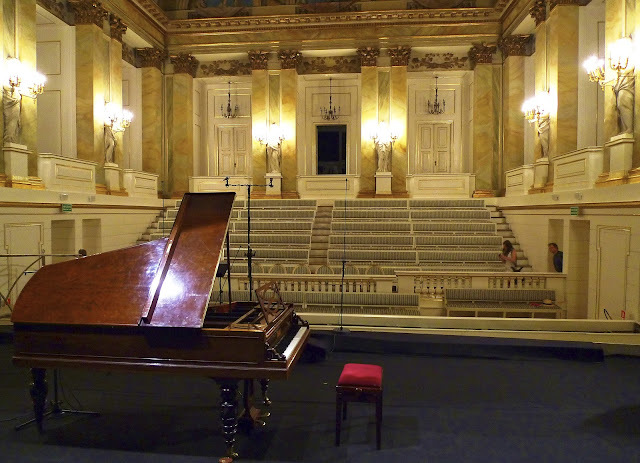 On the Pleyel the sensitivity of his phrasing, touch and tone - the sheer poetry of the interpretation - was touching and poignant as dusk enclosed the theatre like the wings of a dark moth. The concert concluded with a work I had never before heard, V narodnim tonu (In a Folk Mood) Op. 73. Dvorak was raised in the rustic environment of peasant villages and was clearly drawn to folk music. As he was not an exile, his approach does not have the intense sublimation and nostalgia inherent in say Chopin's Mazurkas. Dvorak is of course justifiably world famous for his Slavonic Dances. He loved the landscape and nature of his native Bohemia and spent almost twenty summers at his villa in Vysoka. I toured Bohemia a couple of years ago and it is indeed superb countryside, full of rich greenery and rushing streams. There such beauty in the Czech Republic outside of Prague in Bohemia and Moravia which too many visitors neglect to their cost. The melodic lines of the four songs (he chose only the texts of four folk songs) is simple, delightful and quite memorable. After listening to all these songs (despite a rather undistinguished voice, listening was a real pleasure in the face of the sad decline today of the popularity of Lieder recitals) one can only conclude that even in his modest output of songs, Chopin's superior genius for melody sweeps all before it. And so closed another unique musical and aesthetic experience courtesy of the Chopin i jego Europa Festiwal. ***Wojciech Switala has recorded many truly outstanding solo Chopin discs for the historic 'Black Series'. Please make the effort to buy some of his CDs - they are superb. For those readers with Polish language, the literary journal Zeszyty Literackie have released a Newsletter one can sign up for dealing with Chopin and this Festival. Sorry to disappoint but I was entirely unable to obtain an advance ticket for this concert (and for too many others) despite even queueing outside on the night - something I rarely do. With the burgeoning reputation of this young Ukrainian pianist (now carrying the mantle of Richter and Horowitz), why it was not placed in the Filharmonia Hall I have no idea - it could have sold out there too. Tourist tour groups have block-booked seats for many events at the festival this year as it is the only classical music on in Warsaw towards the end of summer. Great for the organisers to fill the hall but the rest of the melomanes who live here in Warsaw? Frustrating in the extreme. The long queues of 'the disappointed' speak volumes. Could not an advance Karnet for all the festival concerts be introduced as at Duszniki Zdroj? Many concert-goers would purchase it I am sure and the stress of ticketing for each concert would be neatly removed. My good friend the musicologist Professor Irena Poniatowska and the well-known musical journalist Adam Rozlach (both of whose musical opinions I highly respect) told me his performance was magnificent with great virtuosity, drama and fire. Irena was particularly impressed with his exciting account of the Chopin Preludes Op. 28 and she has heard everyone play this work. Well, I ordered his two Decca recordings which have received rave reviews but it is never the same as hearing a pianist live as Artur Rubinstein knew so well. Since his first apearance at this festival in 2008 I always look forward to hearing this intellectually precocious, refined, gifted and naturally musical Polish-Canadian pianist, Jan Lisiecki. He is certainly one of the finest young pianistic talents to emerge in recent years. Also the dyrygent of the Sinfonia Varsovia on this occasion was the distinguished and celebrated pianist and conductor Christian Zacharias. A promising partnership. The evening began with yet another work unfamiliar to me, the Overture in E-flat major by Paderewski. In fact this Overture was only performed first in June 1991 and published in 1997. He gave it no opus number so perhaps had disowned it himself! I am terribly fond of the compositions of this underrated, lyrical composer whose output has been undeservedly overshadowed by his legendary status as a pianist and statesman. He completed this work in Berlin in 1884 when studying with Heinrich Urban. I found it a charming piece full of those innocent, slightly naive, tuneful melodies Paderewski so loved. I am always reminded of lyrical pic-nics in fields of wildflowers during the Polish summer when I hear his music, uncluttered by melancholic neurosis or inner torment. 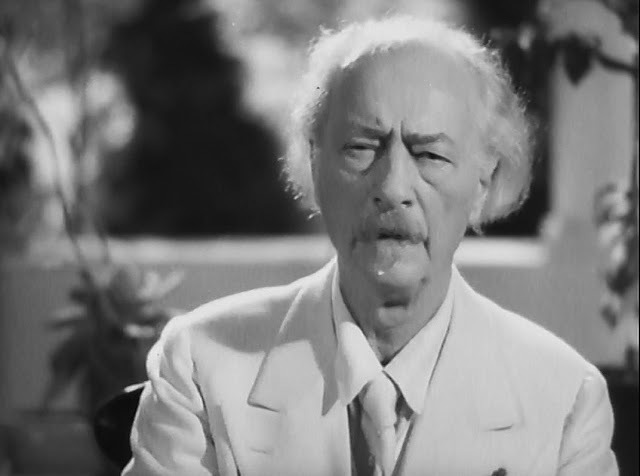 The black and white 1937 film starring Paderewski Moonlight Sonata captures this aspect of his nature to perfection. I adore this wonderful film as it speaks of a time where true feeling, graciousness, respect, empathy, sensibility, charm and poetry still meant something to civilised people in their relations with each other. The performance of the Moonlight Sonata itself is impressionistic and deeply poetic. Paderewski was 77 when he made this film. Do try and see it somehow - a sentimental dream when one did not have to apologise for being sentimental. Jan Lisiecki then joined the orchestra for Schumann's Piano Concerto in A Minor Op. 54. This was an excellent performance as one might imagine which certainly confirms the range of repertoire that Lisiecki can approach with confidence. However I did feel that at this stage in his career (he is only 17 after all) he had not come to terms with the mercurial temperament required for this great work and perform it with the sort of authority utilised by a more mature artist. This will doubtless come and of course he must obtain the experience of performing it in public - I have simply heard too many great artists play this concerto to be fair, objective and refrain from quite undeserved criticism. After the interval we were treated to a marvellous performance of the first version of Schumann's Fourth Symphony (the edition recommended and prepared by Brahms but strenuously objected to by Clara Schumann for various complex reasons). The appropriate term 'symphonic fantasy' was used by Schumann in the original title and seems to have been perfectly understood by Christian Zacharias highlighting all the shifting moods, flashes of passion, breathlessness, firm rhythms and tenderness one associates with Robert Schumann's remarkable musical psyche. One aspect of this conducting mystifies me. Whenever there is a repeated phrase, of which Schumann gives us many, Zacharias repeats it with exactly the same dynamic, phrasing and articulation. Musically this seems to me so unimaginative - many 'great' conductors do the same. The Sinfonia Varsovia deserve a conductor of the stature and brilliance of Zacharias and rose to the occasion. To my mind they have suffered since the departure of Menhuin...a very personal opinion by the way. It will be of great interest for listeners to learn of a brilliant new debut recording Jan Lisiecki has made for Deutsche Grammophon. Two Mozart concertos with Christian Zacharias conducting the Bavarian Radio Symphony Orchestra. I found it crystalline and luminous with wonderfully, transparent textures, a refined not clamorous touch and seductive tone. The partnership with this orchestra and Zacharias (himself a masterly Mozartian) has produced quite superb interpretations - energetic, stylish and elegant at once. They carefully chose two of Mozart's most contrasted, popular and greatest concertos, the darkly passionate and 'Romantic' No. 20 in D minor K. 466 and the sunny and sweetly nostalgic No.21 in C major K. 467 (the Andante movement is the so-called 'Elvira Madigan' theme from the romantic film of the same name - this ground-breaking use of classical music in film is so dear to those 'of a certain age'). 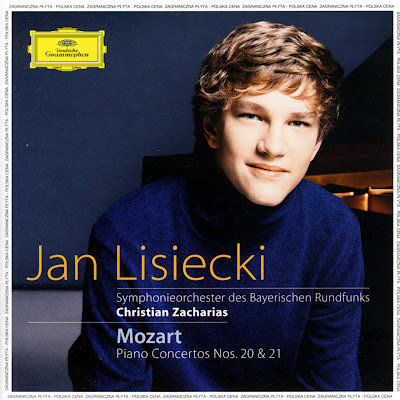 I predict a flurry of awards for this recording - an astonishing debut for Lisiecki and Deutsche Grammophon. The recording quality is also outstanding. Without making invidious comparisons, this quality of sound reminded me of Rafael Blechacz, winner of the 2005 Chopin competition. Any outstanding player of Chopin (and Lisiecki certainly is that) seems to automatically play Mozart remarkably well - not surprising when you think of it, as Bach and Mozart were Chopin's musical pinnacles. The Diapason decouverte winning recording below is now established as one of the finest of these great concertos, preserving as it does the quality of youthful, innocent exuberance and melodic charm brought by this young artist and so vital to these works. They are not concertos for the profound, mature and philosophical performer. What an embarrassment of Brahmsian riches - two of the greatest piano concertos ever written on the same evening performed by exceptional pianists. The Brahms House in Baden Baden visited on my recent research trip for a book I am engaged upon. It is the only original dwelling that survives associated with the composer. 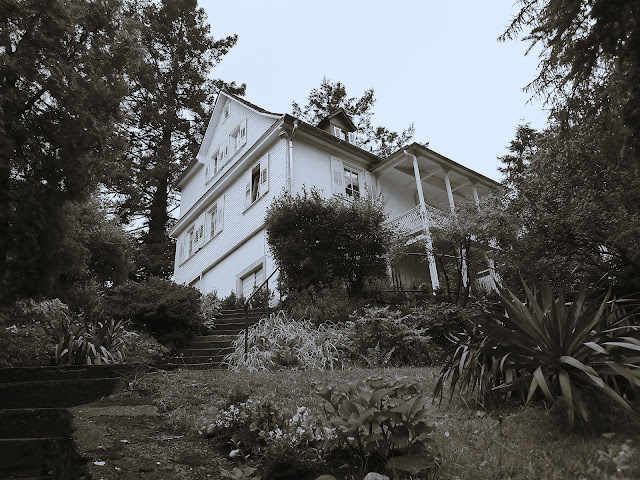 During her concert tours Clara Schumann discovered this beautiful resort and her presence drew him to this rented two-room accommodation in Lichtental. He frequented the house later than the date of composition of the D minor Concerto (completed 1859). He lived here during the summer months from 1865-1874 and in this house completed large parts of the Deutsches Requiem and the First Symphony, the draft of the Second Symphony as well as many chamber works. Composers and students may stay here to absorb the atmosphere and vibrations, work and study during the summer months. I was only familiar with the American pianist Nicholas Angelich from his magnificent recording of the Brahms B flat major concerto with Paavo Jarvi conducting the Frankfurt Radio Symphony Orchestra (Virgin Classics) - to my mind one of the greatest recordings of this concerto. Angelich has a particular and singular affinity with Brahms (a most unusual quality in a modern pianist). His recordings of Brahms chamber works - the Trios - have won many awards and been universally praised in the highest terms. I was desperately anxious to hear what he would make of the D minor, one of the towering compositions in the piano and symphonic literature. I was not to be disappointed. From the outset it was clear he would be faithful to the text (soloists entry marked piano - seldom observed) and had studied and unravelled the monumental architecture of this work. It also became clear that it was to be a true and personal 'interpretation' rather than a bland, 'correct' virtuosic 'presentation' of the work. Yes, it was at once full of the pianist's personality yet faithful to the composer. The opening Maestoso movement was truly that in tempo, an exalted argument expressed with great noblesse and grandeur, fully capturing the deep vein of Germanic seriousness and profundity, the metaphysical dimension beyond the veil. He allowed the music to breathe treating each note and phrase as if it were a living being, the tonal and harmonic weight of individual notes within those huge chords calculated superbly. The tempo was not rushed which gave our ears time to hear the drama and the heart to beat, to react in sympathy with the music as it unfolded. A rare experience in today's image-obsessed, sensationalist society of too many young pianists. The Adagio was truly profound with marvellous control of tone colour, ardent tempo, nuance and dynamic. The emotional weight and spiritual considerations spoke directly to the soul here - the tempo causing the emotional inclinations to unfold slowly like a flower. I felt someway into this immense movement he was teetering on the cusp of being too slow (as I am sure many accustomed to the 'standard version' would feel). But then I would hear another heartfelt progression, delicacy of tone, pianissimo dynamic and.....be utterly convinced of the rightness. The sheer selfless lyricism of his reading was certainly an unaccustomed experience. Most pianists do not allow Brahms to meditate in this work and search predominently for the magnificent forward-driving energy that surrounds the heart of the work, this Adagio movement. I would rather they explore the psychological and soulful reflections within it. I felt the orchestra had difficulty with this interpretation under Jacek Kaspszyk. His conducting revels in the broad strokes and launching exuberantly into the huge tunes and dances rather than reveal the subtleties and nobility in the score that Angelich was endeavouring to elucidate. I fancied I could feel a tension between them but it was not sufficient to unhinge the performance, the pianist's dominance of yet integration with the orchestra. Angelich continued to communicate his own intense emotional involvement with this work in the Rondo. Allegro ma non troppo. You know the phrase 'ma non troppo' is such a personal decision and again by adopting a less than frenetic virtuosic tempo I felt he allowed the music a structural openness and developing excitement so rare today despite all the emphasis on structure per se. I could actually hear, had been given the time to absorb what Brahms was achieving harmonically. The pianist allowed himself room to move dynamically which gave the work a finely shadowed and chiaroscuro palette of colour. Angelich was clearly emotionally wrung out at the end of this performance (as was Brahms after he dreamed he was playing this concerto during its gestation 'I was absolutely shattered' he wrote to Clara Schumann). Angelich managed to erect an immense musical cathedral for us. The work makes huge physical and psychological demands on a pianist as committed as he is to being a medium through which Brahms expresses his spirit, as he conceives of it. For me his reading will add to that small group of truly memorable musical experiences of my life. Others may not agree. Perhaps I was in a particularly receptive mood that night. I was one of the very few to give him (and of course them) a standing ovation and many 'Bravos'. Rare for me. Brahms was so demotivated by the poor reception of his first piano concerto and he waited twenty two years before writing another. This more accessible concerto does not have the difficult monumental integrated symphonic structure of the first, the piano and orchestra being more in balance. It has four movements and was premiered in Budapest late in 1881. Clearly Francois Guy is a powerful virtuoso pianist as the opening Allegro non troppo indicated. He seemed to please the conductor a great deal with his interpretation of this grand and demanding work. The scherzo (Allegro apassionato) was tumultuous and brought off with great panache. The Andante, at least for me, did not plumb the depths of sentiment and feeling Angelich is capable of in Brahms but was 'poetic' enough. The cello solo that accompanies the piano was richly phrased and simply beautiful. This eloquent theme sang like the song Brahms was inspired to write later called Immer leiser wird mein Schlummer ('My Slumber grows ever more Peaceful'). The complex Allegretto grazioso was brought off with great energy and drive, Hungarian rhythms highlighted, the orchestra and soloist working closely together. Kaspszyk was tremendously enthusiastic at the conclusion, as were the French contingent in the audience! Well, this turned out to be quite an evening! 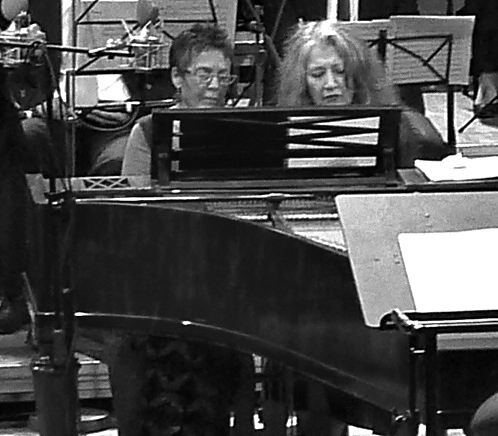 The highlight of course was Martha Argerich and Alejandro Petrasso playing transcriptions of tangos on two pianos at 01.30 am the following morning - but I will get to that in due course. The evening did not open promisingly for me with an arrangement of an obscure academic work by Chopin perhaps written as an exercise from a book he was reading at Nohant by Cherubini: Cours de Contrepoint et de Fugue - the Fugue in A-minor (1841?) arranged for strings by the contemporary Polish composer Pawel Mykietyn. It opened with intentional out of tune string playing as if from a student orchestra (a heavy ironical statement) which resolved into an undistinguished, but at least harmonically grateful work. What ever possessed the conductor to choose this I do not know - some explanation would have assisted the bemused audience used to wonderful Chopinesque melodies and expecting another. Everything Chopin touched or was rumoured to have touched is not of the highest musical quality simply because he was Chopin. He realised this himself. Anyway not a good or even archivally interesting beginning. 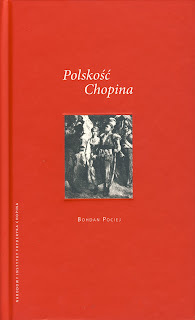 Best kept for discussion among musicologists at the International Chopin Conference in Warsaw. 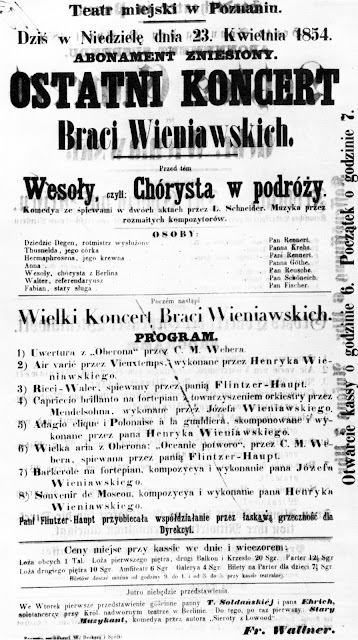 An interesting aspect of the programme this evening was that it contained works by both Wieniawski brothers, Henryk (1835-1880) and Jozef (1837-1912). Henryk's compositions remain popular but Jozef's have rather fallen from grace. They Wienawskis were accomplished musical family. Henryk was attracted by the violin and Josef the piano and they became professional musicians. They appeared together in many salons in Paris, Warsaw and St. Petersburg until Henryk married Isabelle Bessie-Hampton in 1860. 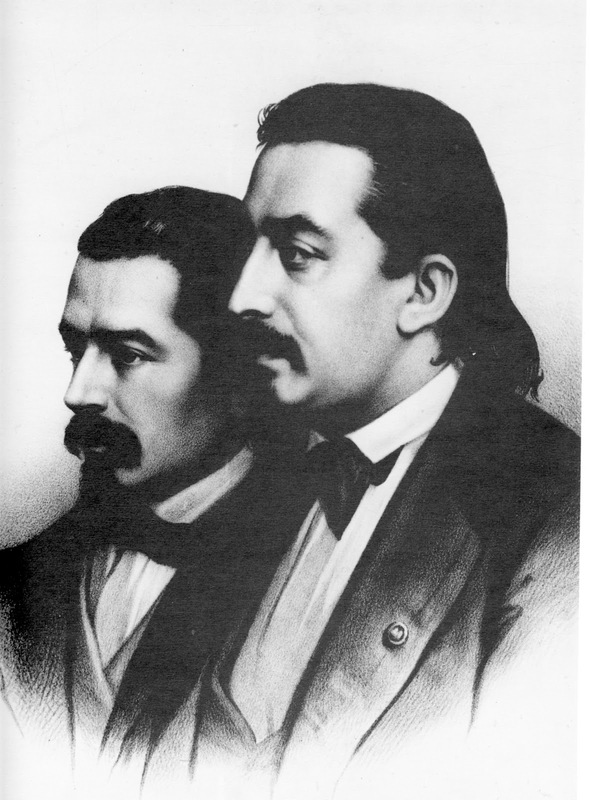 Both were prolific composers and rather different personalities - Henryk a true bon viveur and Josef a more introverted academic type. The Polish violinist Aleksandra Kuls has won many international prizes including being a semi-finalist in the most recent 14th Wieniawski Competition in 2011. Incidentally this competition was won by the sublime South Korean Soyoung Yoon who I heard at Duszniki Zdroj earlier in August (see posting). Kuls' high placing was evident in her fine performance this evening of the popular Wieniawski Violin Concerto in D minor Op. 22 which the composer dedicated to Sarasate. She has a lovely bloom to her tone, great finesse of intonation and musical sensitivity as well as an excellent rhymic sense which was evident in the virtuosic third movement Allegro moderato (a la Zingara). The Romance. Andante non troppo was ardently performed but never lapsed into sentimentality. A fine performance indeed with a perfect dialogue between orchestra, violinist and conductor much appreciated by this audience. After the interval, most interestingly, we then were treated to Jozef Wieniawski's Piano Concerto in G minor, Op. 20 (1858). I have a particular interest in this composer as the commissioned biography I am writing of my great-uncle, the Australian pianist Edward Cahill, led me to him. Many of Jozef Wieniawski's smaller virtuosic piano pieces were very popular with concert pianists in the 1920s and 1930. Cahill played a number of them which was how I first encountered the name Jozef, at first confusing him with his brother Henryk. 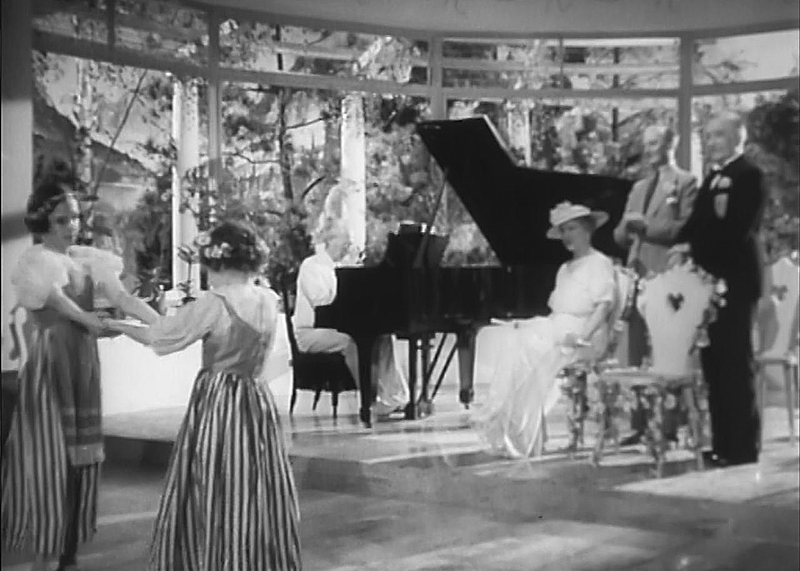 Cahill often played Jozef's enchanting Valse de Concert No. 1 in D flat major Op. 3 having great success with audiences. It is a great pity such pieces have fallen from favour with young pianists but the disillusioned and power-fixated sensibility of our day is so exponentially different from that which existed among cultured people before the two world wars what can one expect? One should really congratulate Michal Szymanowski for going to the labour of learning this concerto and committing it to memory - so many notes and to paraphrase another context, decidedly 'too many notes' sometimes! The piano writing is Lisztian in flavour and stunningly virtuosic. 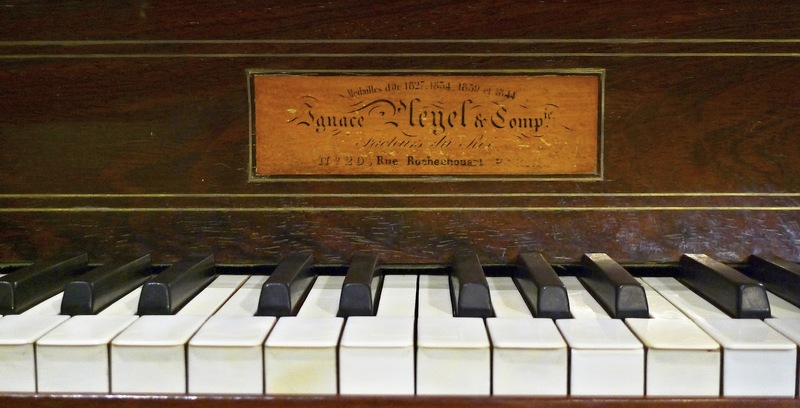 The first entrance of the piano must have shocked the socks off the contemporary audience - a bravura cadenza begins the work for the instrumentalist. But I must say I found the major themes rather undistinguished and the writing strangely empty of anything except extreme virtuosity and Polish nationalist sentiment and emotion (a krakowiak in the final movement) - quite understandable however at such a time of brutalist occupation! Actually I am not surprised this concerto is rarely - if ever - performed by celebrity pianists. In their great concertos both Melcer and Moszkowski both bathe in oceans of uplifting nationalist expression which sweep one wonderfully away into tearful realms, but not I fear Jozef, at least in this concerto. I am rather unfamiliar with the rest of his substantial oeuvre. The Polish composer Wojciech Kilar (1932 -) has received numerous awards for his creative achievements including most recently the Order of the White Eagle. 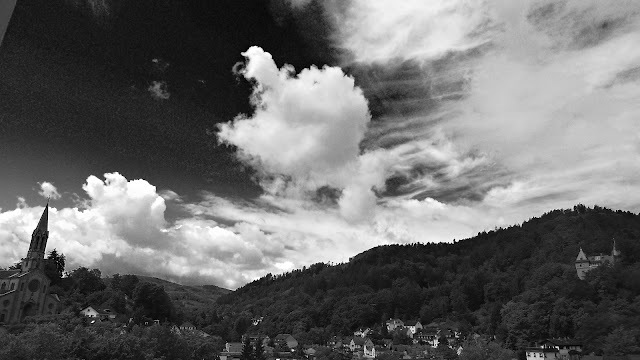 We heard the stirring Orawa, a work for chamber orchestra inspired by the music of the gorale in the mountainous High Tatra region of the south of Poland. We then heard that marvellous Polonaise (1998) from Andrzej Wajda's film of the Polish epic poem Pan Tadeusz. I used this music to great effect when lecturing on Polish landscapes at the Royal Geographical Society in London a couple of years ago. A fitting conclusion to a concert featuring only Polish musicians and Polish compositions (pace Massenet) - a rare enough treat in a time of foreign musician worship! Martha Argerich is greatly loved in Poland and has a very close musical relationship with the country ever since winning, with her 'electric fingers', the 7th International Fryderyk Chopin Competition in 1965 at the age of 24. Subsequently she has served a number of times on the jury of the competition, most recently during the slightly controversial 16th competition in 2010. Many of the musicians performing this evening were associated with the eleventh Progetto Martha Argerich (Martha Argerich Project) in Lugano in June of this year. Of course she is now a legend in her own time. The evening opened with a group of Mazurkas from the Op. 50 set by Karol Szymanowski (1882-1937) performed by the Japanese pianist Akane Sakai. These mazurkas are in one sense 'rougher' than Chopin's in that they are not intended to be danced as a few of his were ('Mazurka Madness' had taken over Europe's musical ballroom life in the nineteenth century). Szymanowski's are often directly inspired from the folk music of the High Tatra mountains of Poland and the Kurpia region (the Mazowsze region on a plain where Warsaw stands). This is not to say that subtlety and sentiment do not appear in them - but they are rather more bucolic than Chopin's sublimated, often nostalgic, mazurkas. 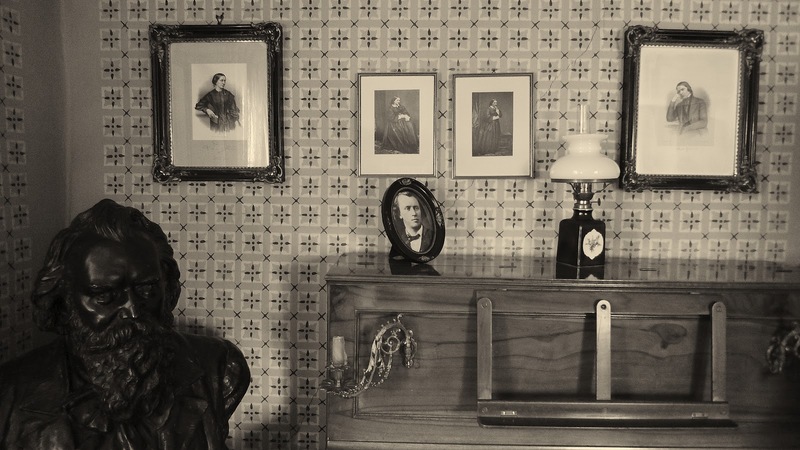 From 1930 the composer lived at Villa Atma in Zakopane in the Tatras (now an interesting museum devoted to him). Nostalgia is certainly present in the next two mazurkas Sakai played (No.9 - Echo from the Tatra Mountains and No. 7 Grazioso) by Roman Maciejewski (1910-1998). I had never heard them before and found them romantically sensitive and yet contemporary in compositional technique and tonality - a rare combination. All these difficult works were played convincingly with finesse, rhythmic exactitude and understanding of the complex harmonic structures. 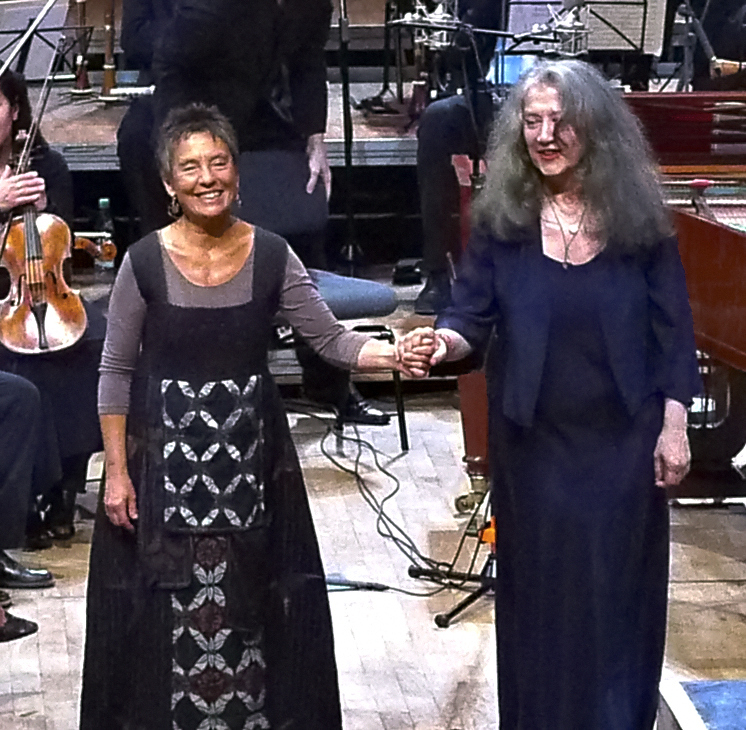 Martha Argerich then walked onto the stage with her daughter the Swiss viola player Lyda Chen amid tumultous applause and shouts. They would perform a rarely heard work by Schumann, the Marchenbilder Op. 113 for piano and viola. 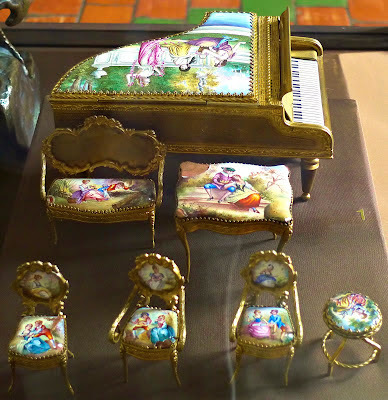 The work is in five movements, rather in the nature of literary fantasies or as the composer put it 'fairy-tale illustrations' (Rapunzel, Rumpelstiltskin and Sleeping Beauty from Grimm's fairy tales) with only the tempo marked lacking colourful titles as in say Carnaval. I have always found the rich mahogany tone of the viola deeply moving but one rarely hears it alone. This is a truly beautiful work, the unaccustomed viola taking one into previously uncharted worlds of sound and sentiment. They completed this section with the Adagio and Allegro, Op.70 also by Schumann. Argerich has always played Schumann brilliantly to my mind, her own temperament capturing perfectly that elusive mercurial, passionate and whimsical nature of the composer. What an extraordinary programe of music had been compiled on this enchanted evening! Remember it was now about 12.30pm in a Radio Concert Studio in Warsaw. Yet another work I was unfamilar with...goodness me what an education this festival is....the Suite in G minor Op. 71 by Maurycy (Moritz) Moszkowski (1854-1925) scored for two violins (the prize winning Canadian Lucia Hall and the great Austrian pedagogue and player Dora Schwarzberg) with the Russian-Armenian pianist Elena Lisitsian. They appeared an unlikely group but this was quickly set aside and the music they produced was civilised, charmant and spoke of a more elegant past far from our century and before cynicism and disillusionment set in. What was the logic of including this work I wonder? Perhaps it was the sheer Polish elan and esprit the work contains in its three Allegro and one Vivace movement. A piece to lift the most melancholic spirit. After the interval a real delight was in store. We were to hear five of a group of twelve transcriptions of tango dances for piano solo entitled PIANO solo, solo TANGO (roughly translates I suppose as Only Tangos on a Solo Piano). A tango craze is currently taking place all over Europe in dance studios I am told, but today's passion for the dance is not the first time. This infectious Argentinian dance, perhaps one of the most sexually explicit and alluring of all ballroom or even private dances, raged in Europe as joyful compensation following the horrors of the Great War. 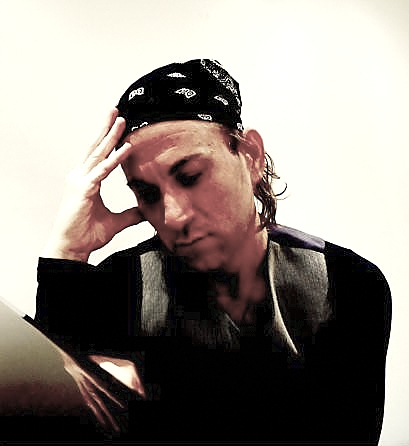 Alejandro Petrasso is an Argentinian pianist, composer, improvisor and arranger of remarkable and unique talents. On stage he wears a colourful bandana and trousers, in fact costume, reminiscent of the pampas. One can be in no doubt the music is not to be Op. 111 by Beethoven. These were transcriptions of rural songs or tangos by lyicists or bandoneon players (a type of concertina indispensible in tango ensembles in Argentina). They were absolutely splendid and foot tapping. Virtuosic in a Lisztian fashion too or perhaps even Art Tatum crept in there on occasion. But why were there two grand pianos on the stage? The artist had finished his selection, had received his flowers and was bowing. Martha Argerich suddenly appeared in that disarming way of hers to play more tangos arranged by Petrasso for two pianos. Cheers and anticipation! It was quite fantastic to watch the seventy-one year old piano legend Martha Argerich, long grey hair in wild dissarray, ethnic bracelets on wrists vibrating with her phenomenal technique, muscular fingers belting out Argentinian traditional tango dance music with Petrasso in his bandana and pampas kit. Terrific rhythm and drive - joyous and brilliant. A scene and sound I shall never forget. Bear in mind this Dionysian tango revel was taking place at 1.30 am in a Warsaw radio studio! Wild scenes. Standing ovation. Flowers. Encores and exhausted farewells. What a great night and such fun. 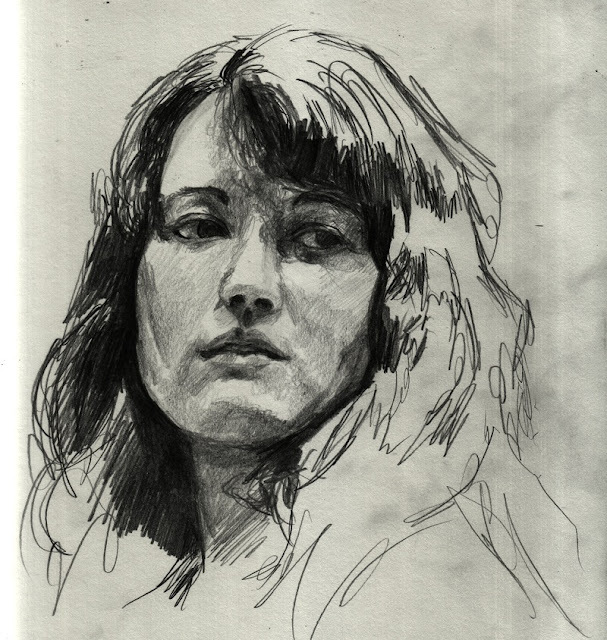 What a wonderful girlfriend the exotic creature Martha Argerich must have made in her youth - lucky chap whoever he was! 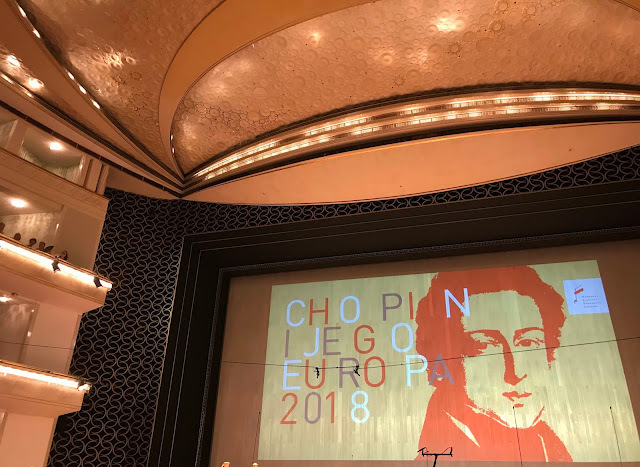 Another once in a lifetime musical experience I shall never forget courtesy of Chopin i jego Europa. Any reader of this blog knows my respect and admiration for this young genius. It was with the greatest emotional and intellectual anticipation I approached this recital. Apart from the Chopin Op. 25 Etudes, this entire recital took place in an imagined world of the most impressionistic and colourful fantasy imaginable. Trifonov's world. He began with possibly my favourite among the Scriabin Sonatas, No. 3 in F sharp minor Op. 23. This key and C sharp minor are my favourite keys which probably reveals something about my sensibility and character – the eighteenth century would have thought so anyway. This rather short sonata is divided into four main sections according to the Russian musicologist Lev Vasilyevitch Danilevevich and according to the programme Scriabin himself later invented for it entitled States of the Soul. Expressing these hallucinogenic indications by Scriabin (what inspirational madness lies here) is a tall order for a young man to come to terms with, quite apart from actually digitally mastering the work. Trifonov appears to me to possess an ability to launch himself effortlessly into communication with such metaphysical states which energizes and inspires him. The great Grigory Sokolov is similarly transported during recitals. Of course the Stanislavsky Russian tradition of acting encapsulates the theory of focusing your energy internally on what you wish to communicate onstage, in fact ‘becoming what you wish to express’ even through bodily gesture. Both pianists seem to be physically transformed physically in a similar way by their conceptions and translate this into sound. He performed this work at the recent Arthur Rubinstein Competition and as you will know won this competition. His interpretation tonight was as extraordinary as Scriabin’s description. His range of color, articulation, dynamic variation, touch, tone and phrasing is something marvelous. I have really nothing further to say after this performance, always a sign of the utmost excellence. We then heard three Fairy Tales by Nicolas Medtner (A minor Op. 51 No.2; E flat major, Op.26 No.1; B flat minor Op.20 No.1). It seems absolutely appropriate in view of the forgoing observations that he would choose these enchanting and fantastical works – rarely performed in recital. Emil Gilels was also very fond of Medtner as a composer. He often performed the Sonata Reminiscenza in A minor Op. 38. Trifonov produced marvelous renditions that conjured up extraordinary and exotic imagery. The first half of the recital ended with a wildly percussive and virtuosic account of the Guido Agosti piano transcription of Stravinsky’s The Firebird (1910/1928). This work was the first ballet score Stravinsky wrote for Diaghilev’s Ballets Russes and follows in the Russian tradition set by the fantastical operas of Rimsky-Korsakov. 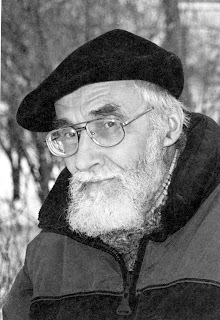 The composer worked with the choreographer Mikhail Fokine. In his mind’s eye Trifonov was clearly seeing the magical glowing bird of this Russian fairy tale in the ballet as he played. In a similar way to the manner in which he portrayed Mephistopheles so convincingly at Duszniki, he put the frighteners on this audience when interpreting the thematically insistent, fervid, hectic, evil, insinuating, threatening and grotesque Dance infernal du roi Kastchei. The Berceuse was quite haunting and ravishing in its different timbres, color, cantabile and piano to pianissimo range of dynamic. In the Finale the glowing bird seemed to hover triumphantly above Kiev, Moscow or St. Petersburg as the great bells of the Russian Orthodox Church pealed amid lightning glissandi and the thunderous victorious conclusion. Considering it s the 150th anniversary of the birth of Claude Debussy (almost to the day – August 22) I was so pleased to hear Images (1) (1905). We have really not heard enough Debussy in this festival considering its subtitle. Again, this showed Trifonov as a young master of colour and impressionistic sound. Reflets dans l’eau was beautifully painted in impressionistic sound remaining true to its title. Hommage a Rameau was as yearning and nostalgic as one might wish. 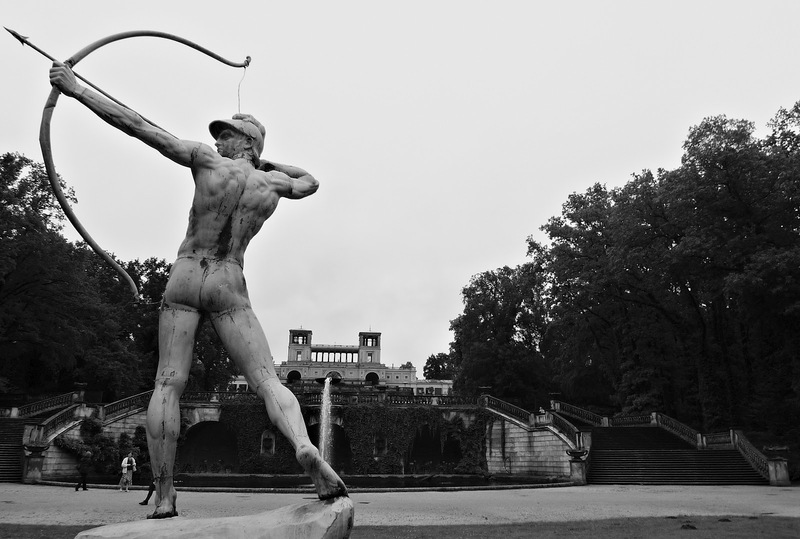 A melody from Rameau’s opera Castor and Pollux inspired Debussy to write this piece and also perhaps a romantic sense of the transience of life. 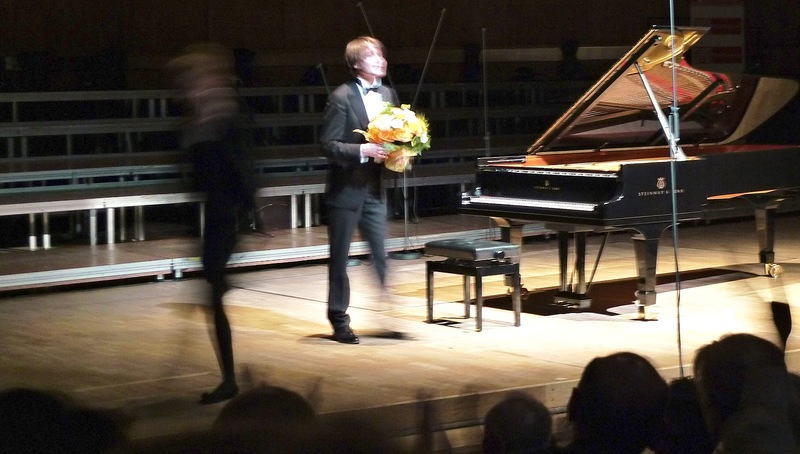 Mouvement revealed as one might expect, Trifonov’s virtuosity and declamatory emotional capacity. As ever I have been spoilt by Michelangeli’s 1971 recording of Images 1 for DGG where the actual sound he produces from a superb Steinway and his sense of almost improvised recreation is quite ravishing. This Italian aristocratic ultra refinement is possessed also by Piemontesi who surely among Italian pianists has inherited Michelangeli's august mantle. Trifonov’s Debussy is quite different but wonderful too in its unique way. However I felt on this occasion in Warsaw some of the extreme burnish he showed during the Tchaikovsky Competition had somehow slightly worn away – brilliant of course overall...but…there were inexplicable slips. Young contestant winners and those with high rankings are always at their peak during the competition and for a time afterwards. This is especially true of the Chopin competition. Carrying the innocence of earlier Chopin and the newly minted exuberance he brought to his discoveries in sound and technique, the intensity of emotional expression cannot really be sustained into maturity with constant repetition except in the rarest cases. Entropy is a fact of life even for pianists. The young pianist has to be extremely vigilant as the work matures under his fingers to maintain his original creative fire each time under pressure of his career. Pollini has never subsequently equalled his account of the E minor concerto he recorded for EMI shortly after winning the competition in 1960. At this level of technical, musical and digital mastery in the final analysis it is the character of the pianist himself - the breadth of his culture and life experience - that will be the deciding long-term factor in his development as an artist. The two volume autobiography of Arthur Rubinstein should be required reading for any young pianist. There is a connection between the way you live your adult life, your range of cultural reference and the development and spiritual depth of your playing. I am sure this does not apply to Trifonov but there are some young pianists I know to whom it definitely does. This concert was music-making at its very finest and I was indeed privileged to hear this gifted and precocious young man play live once again in Warsaw. Janusz Olejniczak is one of my very favourite Polish Chopinists and he has quite a deal of experience in playing these older instruments. He performed his favourite Chopin Piano Concerto in F minor, Op.21. I have heard him perform this work many times and it remains as ever, convincing and balanced between the classical, styl brillant and romantic imperatives so difficult to grasp in early Chopin. A moving performance containing in abundance what Chopin described as 'the Polish element' missing in so many interpretations. The Orchestra too are now well versed in this elusive element and were a perfect foil and accompaniment to the soloist. The Larghetto second movement was full of adolescent yearning and illusioned love. Olejniczak seems to have understood the emotions expressed here perfectly. In 1829 after a number of flirtations Chopin had become infatuated with the daughter of the superintendent of the Royal Castle, a blue-eyed, blonde opera singer named Konstancja Gładkowska (the muse who inspired the ardent Larghetto of this concerto). He wrote to his ideal, ‘In my unbearable longing I feel better as soon as I receive a letter from you . . . I have nobody to whom I can open my heart.’ As is the way of these things, Konstancja seemed more taken by the uniforms of two young dashing Russian officers than the glances and love-sick sighs of her admiring genius. After the intermission we were to hear the Piano Concerto No 3 in C minor, Op.37 by Beethoven. This account can only be described as perfection - what one might call an ideal performance. The touch, tone and instinctive understanding of the limitations of the instrument made the Pires reading quite superb. The classical style was brilliantly accomplished, the orchestra completely familiar with what one might call the 'passionate reticence' at this stage of Beethoven's creative work. The Largo, perhaps the most beautiful slow movement of all the concerti, Pires played with perfect inner reflection and emotion. What a wonderful artist this diminutive Portuguese artist is! I still treasure her old recording of the complete Chopin Nocturnes for DGG. Again I am speechless with praise for this interpretation. Wild applause and a standing ovation. No encore - another musically refined decision on her part. 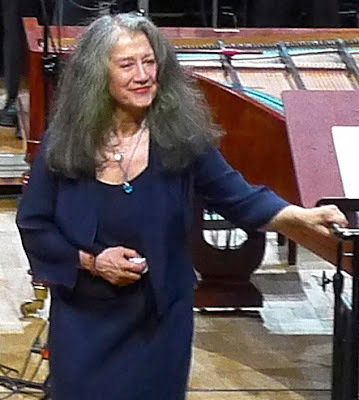 Perhaps only an artist of Argerich's staure could have walked onto the stage with equanimity after the racket that accompanied Pires for what seemed ages. Almost a standing ovation before she played a note so popular is this artist in Poland. She never cancels here to my knowledge. The Beethoven Piano Concerto No. 1 in C major op. 15 is a sunny, youthful work full of charm and humour. Argerich still tends to be a little strenuous on the Erard but the performance was so full of her ebullient personality that it really was a triumph. The quite incredible experience of Argerich, Pires and Bruggen with the Orchestra of the Eighteenth Century made for a unique musical evening. Trifonov was sitting a couple of seats from me - yes I have noticed he often listens to the other pianists - well, he was as enthusiastic as the rest of us! Then Pires and Argerich sat together at the Erard and played Grieg (Anitras Dance from Peer Gynt arranged for 4 hands I think) and the hilarious and rumbustious 3rd movement Allegro molto of Mozart's Sonata K. 381. It was very molto and terribly Allegro. Wild secenes in the concert hall after this. The time was 1.30am - surely only in Poland could such a wonderful concert be staged irrespective of convention time frames. Music of the highest order, so much female glamour in the audience it took my breath away. But we were all packed into such a small hall with scarcely any refreshments at interval. Anyway they were way down in the basement (good old pre-1989 stuff - half a dozen tables, Fanta, Coca-Cola, Snickers, dried out cheesecake, coffee was alright I suppose. Golly, how cosmopolitan, glamorous and exciting in 2012). The audience packed on the stairs, against the walls and up to the soundproof panels in the ceiling. Back to the grim 1980s. 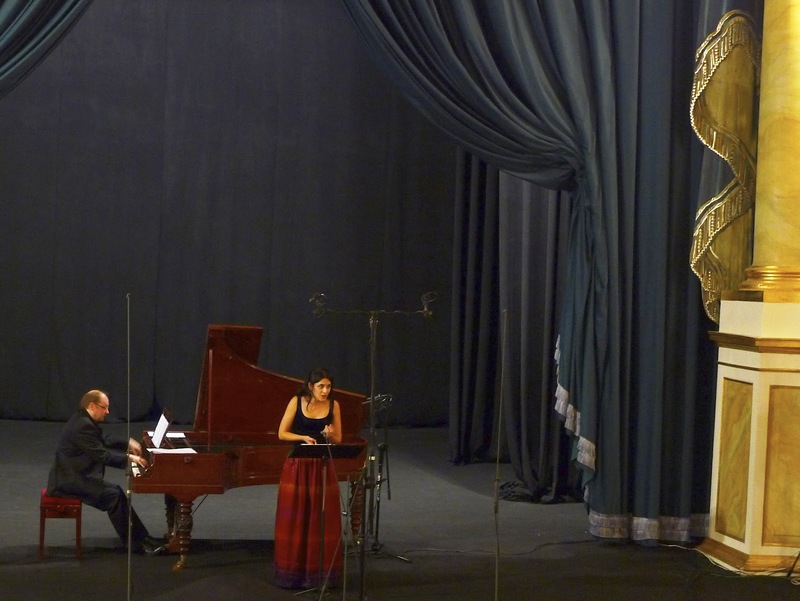 The Polish Radio Studio Concert Room is technically excellent with excellent tuned acoustics(superior to the Filharmonia) but was never designed for this level of international festival demand. The philistine Polish politicians who lack the culture to properly financially support the musical arts and build a modern concert hall in Warsaw with the adequate facilities are squandering the potential cultural prestige that Poland so rightly deserves in Europe. Chopin i jego Europa is a brilliant festival of the highest world-class standard. This is why such great artists as we have heard throughout it agree to perform here. I should know as I spend much of my life when not writing books attending such festivals. Do not they realise this waste of potential? Then at their international summits they have the hypocrisy to crow about 'Chopin the Great Pole' and 'The Great International Chopin Competition' while giving no significant support at home to music. Of course there is 'support', I am well aware of that, but I am talking about real support of a significant financial order. Real money, not grudging chicken feed. The budget for poor and rather desperate Mr. Paleczny at Duszniki Zdroj, an absolutely unique piano festival and the oldest in the world, had a significant budget cut this year. The entire budget for Duszniki is now a little less than the pianist Lang Lang commands for one single concert. Just consider France and the politicians attitude to culture there. Then Britain, Germany, Italy... Even their provincial houses are superior to Warsaw. Brilliant and modern so many of them. But the politicians there respect culture and realise its prestige and influence. I understand the history of the city of Warsaw that is constantly trotted out as an excuse....I wrote a book on all the horrors after all. I know it. However it is now 2012 and we must move forward - all young Poles agree with me at least on this. And then we have the recent cruel and shocking treatment of the great Polish cultural institution Stefan Sutkowski of Warszawska Opera Kameralna who has had plans for a modern concert hall for years - his pleas fell on deaf ears. Oh yes, if there was personal money to be made supporting culture as there is in supporting sport by building fabulously expensive and now under-utilised football stadiums we would have the support. Oh yes. I am not a pale, withered 'culture vulture', a 'Mr. Smellfungus' against sport. I am active and play various ones - tennis, jogging, swimming and work out regularly at the gym. But I am no longer sympathetic to the 'lack of money' bleating excuse and 'we are poor Poles' argument. It is a question of priorities and political will. The country is in the EU for goodness sake, has had significant EU financial assistance, has performed miracles of reform and growth since 1989. So where is the money going? The present situation is a scandal. The politicians and government ministers should 'put their money where their mouth is' as we say in English or they should be exiled hanging their heads in shame. Orchestra of the XVIIIth Century under Franz BruggenClearly the emphasis of the carefully selected programme this evening was to highlight the influence of the contrapuntal Bach and elegant Mozart on Chopin. It is not widely recognised by the average music lover that Chopin was arguably the greatest master of contrapuntal writing and counterpoint in the nineteenth century. Of course it is all hidden away beneath what appears to be nineteenth century harmonic costume but it is there. The finest pianists understand this and reveal it. We began with Bach's Musical Offering BMV 1079 (1747) arranged for strings by Wim ten Have. All the string players correctly stood to play their instruments in this performance. The story of this work is so fascinating. The King of Prussia, Frederick the Great, was a most extraordinary being. He was treated cruelly by his father, the obsessively militaristic Frederick William I, for wanting to study music and the transverse flute. He possessed great talent, his teacher being the flautist of genius Johann Joachim Quantz. The urbane yet critical English music historian Dr. Charles Burney had a high opinion of the king’s playing and charming compositions when he heard him in Berlin in 1772 ‘…his embouchure was clear and even, his finger brilliant, and his taste pure and simple.’ The paternal accusations directed at Frederick were of betraying ‘effeminate, dissolute and unmasculine preoccupations’. His father, the psychotic militarist Friederich William, often beat him in public with a cane and even forced him to watch the beheading by sword of his best friend. Frederick managed to attract 'the old Bach' to his court in Potsdam and one evening asked the composer to improvise a fugue in six voices on a particularly intricate theme. Even Bach was unable to accomplish this feat but after leaving the court somewhat annoyed he wrote The Musical Offering as a coded critical response to this royal challenge. After visiting Potsdam on a research trip last year - spectacularly impressive gardens on a grand scale together with the elegant Palace of Sanssouci - I read a truly remarkable and thought provoking book which I recommend you also read if you are at all interested in our squandering of Enlightenment principles and this historic meeting and musical incident. Evening in the Palace of Reason : Bach Meets Frederick the Great in the Age of the Enlightenment by James Gaines. The performance was very fine with complete understanding of baroque performance practice - as you might expect from this band. We were now to hear Mozart's Piano Concerto in B flat major, K. 595 (1791 - the final year of Mozart's short life) performed by the South African fortepianist Kristian Bezuidenhout. He makes regular appearances at this festival. Bezuidenhout performed the work on a Paul McNulty copy of a Graf instrument of 1819. This is a fascinating instrument with five 'moderator' pedals to alter dynamic and colour. This concerto was finished on January 5th 1791, some eleven months before Mozart's death. 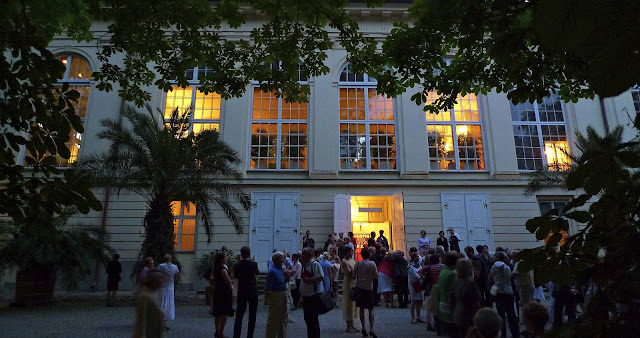 It was performed on March 4th in a small Viennese concert hall situated in, with bitter irony as it turned out in hindsight, 'Gate of Heaven Street' (Himmelpfortgasse). The work divides lovers of Mozart. Some feel it is not as virtuosic as those of the 1780s and is so an anticlimax while others feel it is a distillation of the essence of all that had gone before. the restrained, almost autumnal mood of the writing was evident in this performance. However there is an innocent charm, wistfulness and Apollonian beauty within this work. This is clear from the outset as the Allegro first movement opens with a dreamy accompaniment theme as if a continuation of a piece already being played rather a than his usual confident statement of a beginning. I find the movement operatic in nature in many ways - perhaps this is no coincidence as Mozart was working on The Magic Flute at much the same time. One is immediately struck by the beautiful conversational balance achieved with the earlier more 'speaking' instrument and the orchestra than a lush Steinway. Naturally this orchestra's playing is steeped in eighteenth century performance practice. The Larghetto is poignant with such simple artless themes reminiscent of the piece he wrote for glass armonica that I heard in Duszniki this year. The Graf gives this movement an understated quality of sentiment rather than sentimentality. The Allegro finale is also harmonically adventurous with an infectious lilting theme and rhythm one might whistle in the street after the concert (remember that marvellous scene in the film Amadeus when the priest reacts so positively and agonizingly for Salieri when he finally picks out an aria of Mozart and hums it enthusiastically after he fails to recognize Salieri's own arias). Not a work to carry one away on waves of romantic emotion like the D minor, but elegantly and artistically brought off with classic understatement by Kristian Bezuidenhout and the Orchestra of the XVIIIth Century. I came home and listened to the same concerto recorded in 1975 by Daniel Barenboim and the English Chamber Orchetra from the vinyl set I have. Conducting from the piano surrounded by the orchestra was such a new thing the sleeve notes devoted two huge paragraphs to it! The sound is glorious but what a difference in articulation and pharasing - how far we have come from those days. I treasure the limpidity of Barenboim's playing, the glorious sound and touch, the style and more, the consistency of style throughout the set - a superb performance really but so different from tonight's - a genius like Mozart can offer us so many different faces and many approaches possess equal validity. Harmonia Mundi have recently released a superb recording of juvenile Mendelssohn with Kristian Bezuidenhout (Graf 1824) and Gottfried von der Goltz (violin) directing the Freiburger Barockorchester. The recording is of the Concerto for piano and Strings MWV 02 and the Double Concerto for piano, violin and orchestra MWV 04 written when the composer was 14. The music, performance and recorded sound are all absolutely astonishing. Neither of these works were published in the composer's lifetime, in fact the first critical edition only appeared in 1999. If you require any further validation that Mendelssohn was of the same order of prodigious musical genius as Mozart look no further than these two extraordinary works. After the intermission I was looking forward to hearing what Yulianna Avdeeva would make of Chopin’s F minor piano concerto Op. 21. However I had not read the programme carefully and we were treated to another performance of this student Fugue in A minor by Chopin. I have already given my opinion of this above as it was part of the Wieniawski concert but by another arranger. This time Wim ten Have (a distinguished classical viola and viol player from the Netherlands, who played with Concentus Musicus Vienna and the Leonhardt Consort) dealt with the piece. I felt this was a far more successful effort than the previous offering but have not changed my mind concerning its minor although musicologically interesting nature. Avdeeva played on an Institute Erard. I thought she had given a great deal of thought and practice to mastering the extraction of a beautiful tone from this instrument. Maria Joao Pires was able to do the same but I am not convinced that very many other fine modern pianists have made this difficult transition so successfully. They tend to quite understandably overplay the instrument and the tone becomes brittle and ugly and the action clatters. Not so this pianist. Avdeeva seemed to be able to generate a large volume yet with true beauty of tone to a degree rare to hear. She seemed to have modified her technique with marvellous adaption to the older instrument. 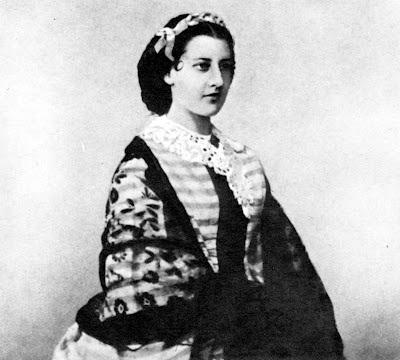 Also her interpretation and integrative melodic phrasing of Chopin’s many fiorituri was stunning – one of the strengths of these earlier instruments with their lighter action – spun like the finest Bruxelles lace – impossible to this degree on a heavier-actioned Steinway or Yamaha. One of the great interpretative problems with Chopin is the balance the pianist achieves between the demands of classical style of say Hummel and the deep vein of romanticism in Chopin's music, as say in the Larghetto of this composition. Her slow movement was restrained but perfectly beautiful – quite different to say Olejniczak’s ardent, romantic Larghetto a few days ago. As with much in life it is all a question of balance. One might almost refer to balancing the masculine and feminine sides of this uniquely difficult composer’s nature. Avdeeva brought off this early styl brilliant composition to perfection it seemed to me, but her approach to Chopin is not to everyone’s taste. Consider the furore surrounding her winning the Chopin Competition of 2010. I thought she would win from the very outset of Stage 1 as I have indicated in my blog on the competition. This was a tiny minority view at the time. But it was her sheer authority at the keyboard, complete technique allowing her to move beyond technique and the consistency of her musical artistry that impressed me. Many I spoke to after this concert, as ever, found her ‘cool’, distant and detached, wanting in expression even unimaginative in her treatment of repeated phrases. As I understand the classical style it is not declamatory in the way many listeners anticipate. Marble columns even of the Corinthian order are cool and smooth although decorated beautifully at the apex. My response to such criticism was that her technique and musicality are outstanding as is her own authoritative Chopin style in this composition. Her adaption of the music to the Erard, the modification of her technique and muscular memory honed for years on a heavy Steinway was really marvellous and triumphantly successful. This process is not easy I can tell you from my own modest efforts on my Pleyel at home! As encores she played a beautiful interpretation of the Nocturne Op. 15 No. 2 and as a second the Mazurka Op. 50 No.3 to highly enthusiastic applause. She seemed very moved by this wild Polish approbration...I will always maintain she was a very worthy winner of the Chopin Competition in 2010. As time passes it becomes increasingly clear to me that everyone has their own idea of Chopin that they will defend to the death! The possessive and heated musical passions generated by this composer and his music are like no other – within national groups like the Poles and within the souls of individuals - personal emotions unlike those towards any other composer I can recall. Watch out! 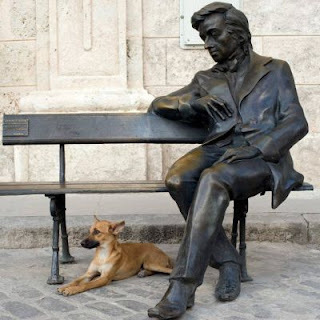 Chopin’s about! And so to the final concert in this excellent series. Anticipation was high and the hall looked to be full. The evening began with La Mer by Debussy. For me this has always been one of the greatest French symphonic works of the twentieth century – the impressionist orchestration is sublime, the Far Eastern timbres, opening in my mind pictures of ‘The Great Wave’ by Hokusai and the South Pacific island where I lived for many years in my youth (Norfolk Island about a thousand miles off the east coast of Australia – home of the descendants of the Mutiny on the Bounty). This performance was rather good (Sinfonia Varsovia are a great orchestra) but for me the conducting lacked sufficient excitement, rhythmic drive, the delicate mystery of dawn and the surprise of different timbres. Not sufficiently subtle or atmospheric for me this rendition. But then, being an ancient human, I have been ruined by the vinyl recordings of Karajan in 1964 with the Berlin Philharmonic and the 1967 Boulez with the New Philharmonia, a recording that some consider ‘cold’ but whose extraordinary discipline sustained me throughout my youth in the South Pacific. After the Duszniki disappointment this year I hoped Dimitri Alexeev would be in better form for the Ravel Piano Concerto in D major for the left hand. He is a great pianist and virtuoso. This astonishing work, at times revelling in its own grotequeries, was written to a commission from Paul Wittgenstein (1887-1961), an Austrian pianist who had his right arm amputated during the Great War. He was the brother of great logical positivist philosopher Ludwig Wittgenstein. The family were highly cultured with regular visits from great such musical figures as Mahler, Brahms and Richard Strauss. Many of the twentieth century’s finest composers wrote works for him (although he did not perform them all) and he evolved all sorts of remarkable techniques of pianistic and sound illusion previously considered impossible for one hand. His is a remarkable story. The concerto opens in a sombre mood on basses with contrabassoon – a most extraordinarily lugubrious opening – life emerging from the horrors of war. This soon gives way to jazz inspired and lyrical writing of a beautiful cantabile character. I thought Alexeev dealt with this superbly and rather instinctively. He clearly has a feel for jazz and with his excellent technique and musicality coped with the physical, rhythmic and dynamic complexities and demands of the piece. Maksymiuk and Alexeev clearly have an excellent musical realtionship and work well together. A definitely courageous choice of work. While watching the pianist one cannot but be deeply moved simply by the extraordinary sight of only one hand used in such a virtuosic manner and knowing the sad reason the work was commissioned. I have always felt this work to be a profound commentary on the tragic, bloody disillusionments of the Great War and man’s struggle and final triumph over adversity of an apocalyptic order where even the pianist himself lost an arm in the conflict. The pianist Leon Fleisher also gives a magnificent account of this masterpiece. As encores Alexeev played a Gershwin Prelude followed by an extraordinary virtuosic arrangement of Polish folk songs – no-one I spoke to afterwards had a clue who transcribed them but a real showpiece and great fun! Was the transcription by Aleksander Tansman? I must say from the melodic point of view I prefer Ravel’s Piano Concerto in G major and find it far more accessible – incidentally the young Martha Argerich gave a blinding account of this particular concerto if you ever have a chance to hear it. After the interval we were keenly anticipating the glamour and talent of ‘the most sought after classical musician on the Web’ with more than 30 million YouTube views. She would play the Chopin Piano Concerto in E minor Op.11 – one of some forty concertos in her repertoire. Without being cynical perhaps this speaks volumes in itself for the ill-fated outcome. I am not in the habit of cruelly dissecting accidents in detail. This was a deeply embarrassing performance by orchestra, conductor and soloist and compassion dictates the event is best passed over in silence. I have no idea why what happened occurred but it was an unfortunate conclusion to a truly wonderful festival. Thank you Mr. Leszczynski for another remarkable festival and I am sure we all look forward to Chopin and His Europe (Chopin in jego Europa) 2013 when I am told by a little bird something very special is in store! 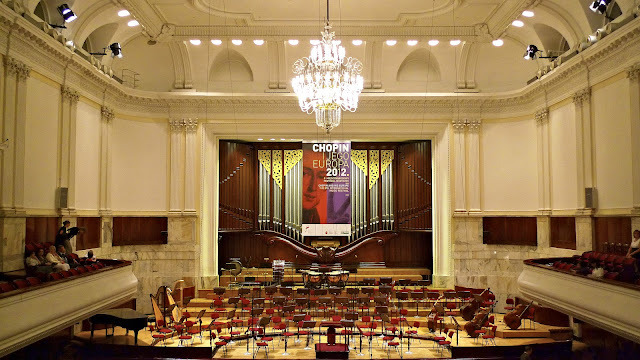 The Warsaw Philharmonic Concert Hall - We are keenly waiting for Chopin and His Europe (Chopin i jego Europa) 2013!